2014 Poison Pill Impetus, by John Laide of SharkRepellent.net, includes an analysis of last year’s U.S. poison pill adoptions. The post is also available at FactSet Insight, 2014 Poison Pill Impetus: Why are U.S. companies adopting poison pills? He concludes that companies continue to adopt poison pills primarily in response to activist investors. In 2014, 57 poison pills were adopted by 54 U.S. companies. Only 13 were routine adoptions –adopted before any publicly disclosed threat. 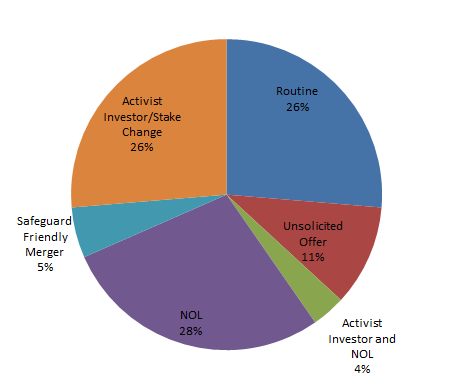 The 18 poison pills protecting net operating loss carryforwards (“NOLs”) adopted in 2014 is a three-year high and is tied for the third most such adoptions in any year since 1998, the first year in which SharkRepellent.net became aware of any U.S. company adopting a poison pill in order to preserve NOLs. Poison pills adopted in response to the company being approached by an activist investor or a rapid-share accumulation represented over a quarter of all adoptions. See also, Anti-Takeover Measures Often Hurt Investors, New York Times, 12/17/2014 and Posts Tagged ‘Poison pills’ at The Harvard Law School Forum on Corporate Governance and Financial Regulation.